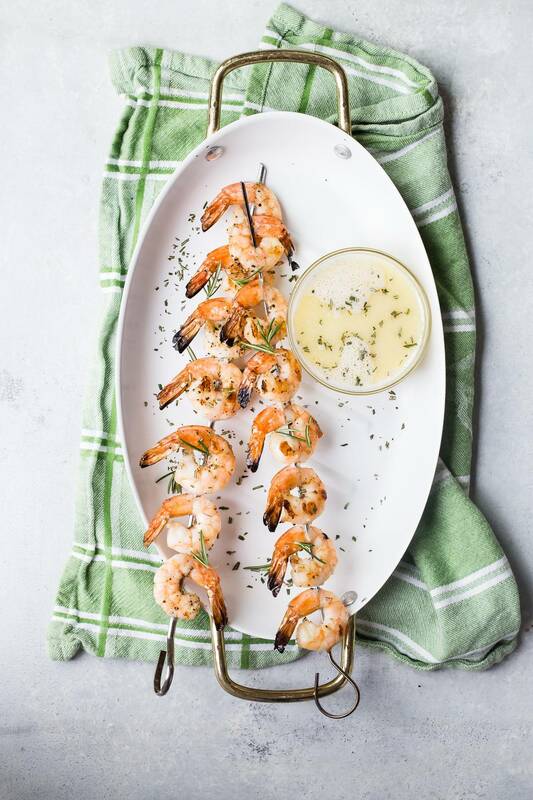 Tasty grilled shrimp skewers served with a rich beurre blanc sauce! Perfect for a summers day appetizer. In case you haven’t been following along lately (gasp!) It’s been all about cooking outside and embracing my inner grill and fire. From Grilled Steak Kebabs with Cherry BBQ Sauce to Grilled Peaches and Vanilla Zabaglione I’ve been skipping the hot kitchen for the (actually just as hot) outdoors! But there’s something fun about cooking outside, even if still hot. For me it’s quiet time, nobody really bothers me when I’m grilling. So with my tongs in one hand and a beer or wine in the other, I’m happy as a pig in mud. This latest recipe had me trying to use up a big bag of shrimp before freezer burn set in. And it also coincided with receiving my new Vitamix Aer Disc Container. I was excited to see what the Aer Disc Container was capable of doing. I had already used it to make the best raspberry lemonade I think I’ve ever tasted, so a sauce for the grilled shrimp made sense! What kind of sauce is Beurre Blanc? Buerre Blanc translates to “white butter” in French and that’s pretty much what’s in the recipe apart from some shallot, wine and vinegar. The sauce is really rich but because it’s so thin, it doesn’t feel like your dipping these shrimp into something like a hollandaise sauce. You can use it for a lot of other seafood dishes, lightly pouring some over the fish or around it. 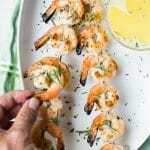 What’s the easiest way to make the grilled shrimp? Keep things simple, good shrimp don’t need a lot of extras. Try and stay away from shrimp with sodium metabisulfite which is a preservative and tastes like a cleaning agent in my opinion. I wrote a whole post on it here, so check it out if you need more info! I like to keep the tails on the shrimp but take the rest of the shell off. This way they’re ready to pop off the skewers and go directly to your mouth. A quick toss in some olive oil, sea salt, and cracked black pepper and they’re ready for the grill. Start by sauteing the shallot and vinegar until reduced and then slowly add in little cubes of cold butter. The secret to making smooth beurre blanc is to do it slowly over a low heat whisking all the time. If your sauce does separate you can add a splash of iced water and whisk it hard to make it return to a smooth buttery consistency. You can use it right away like this but I wanted a frothy consistency for mine. I can only whisk by hand so fast and that’s where my Vitamix Aer Disc Container saved my arms. I poured the beurre blanc into the container, added a splash of heavy cream and set it on high. The unique Aer Disc made it lighter and more frothy, perfect for dipping the shrimp into! I like to use fresh rosemary in everything but any fresh herb like tarragon or oregano would taste just as amazing in the beurre blanc! Check out the video at the beginning of this post for more tips! 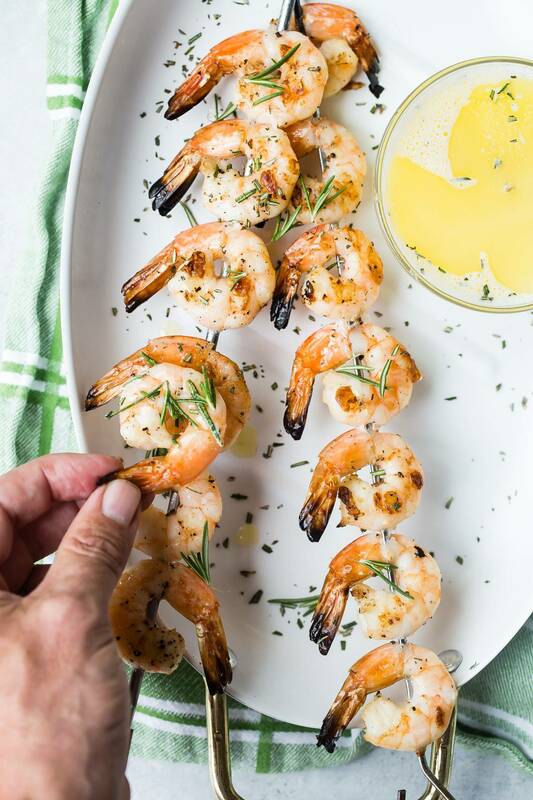 Place the shrimp onto your skewers and season with salt and black pepper. Place the skewers on the grill and cook for about 4 minutes each side. In a medium pan, combine the diced shallot, white wine vinegar, and white wine over a medium heat until reduced by half. Turn the heat to low and add the butter one cube at a time whisking until it's melted before adding more butter. Whisk in the heavy cream. When all the butter has melted, transfer the sauce to your Aer Disc Container and add the chopped rosemary. Start the Aer Disc on low speed and then gradually increase the speed to high until the sauce is nice and emulsified. Pour the sauce into a small bowl and place on a serving platter with the shrimp skewers. 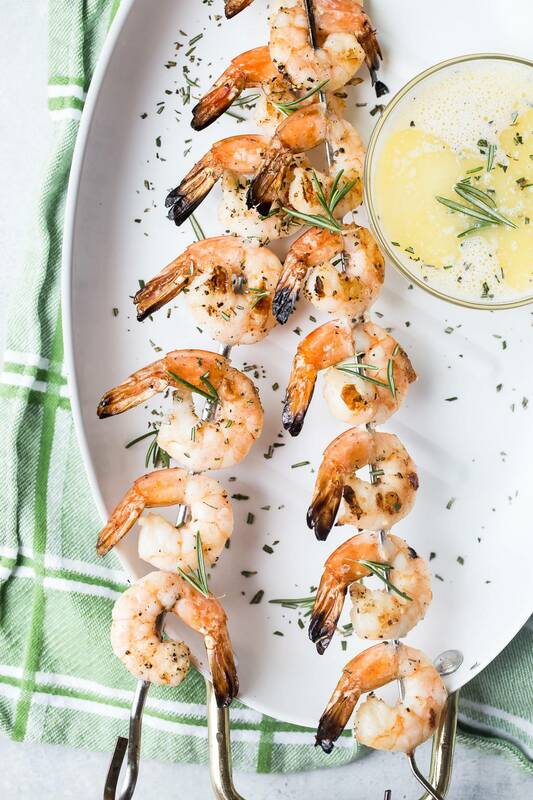 There’s nothing better than grilled shrimp and I love the beurre blanc sauce!